Most can relate to the back-to-reality feeling that descends when a vacation in paradise comes to an end, and home, no matter how sweet, cannot compare. Nathan Abbott is an exception, claiming that other destinations rarely rival the beauty, activities, and people of his Northwest Florida home. Biased or not, the man born in Fort Walton Beach fell in love with life on the Emerald Coast as a boy growing up. Now president of the Nathan Abbott Team, which originated from Abbott Realty, the first real estate company in Destin (established by his father and uncle in 1977), Nathan not only praises the Florida Panhandle’s lifestyle, but makes a point of living it. Nathan also fondly remembers Sunday boating outings with his family, still a favorite pastime. “Over the years,” he says, “I believe we’ve explored every waterway that our area offers. People always think of the Gulf when they visit, but the bays and bayous are just as amazing. For a true appreciation of the area, my best suggestion for tourists is to stop by Destin Harbor to rent a boat for the day and explore.” Destin’s deep waters just off the coast foster an abundance of sea life, and common sightings from boats include dolphins and turtles. For a refreshing dip or a relaxing afternoon that’s a quick trip from Destin’s docks, he recommends paddling or motoring out to Crab Island—once a small island but now an expansive sandbar—just beyond the Destin Bridge in the bay. Nathan also likes to snorkel along the jetties on the other side of the bridge at Destin Pass. People always think of the Gulf when they visit, but the bays and bayous are just as amazing. Point Washington State Forest, which comprises fifteen thousand acres in South Walton County, is a haven for hikers and mountain bikers as well. “I also recommend hiking around the coastal lakes at Topsail Hill Preserve Park in Santa Rosa Beach and nearby Grayton Beach State Park,” he says. 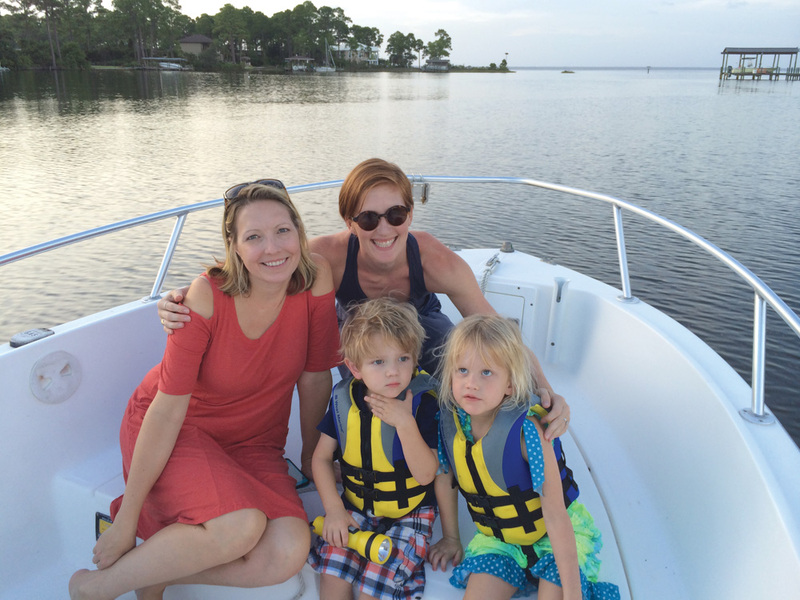 Erin, Amanda, Finn, and Morgan Abbott are ready for a cruise on the bay. If seeking a spontaneous adventure, Nathan proposes a detour off a main highway, like 30-A, onto one of many state roads. “Riding my bike, I’ll cut through a path and find something beautiful,” he says. Deer, bears, smaller mammals, and birds are among the wildlife. “Occasionally, you’ll see bald eagles,” Nathan reveals. Combining his love of the outdoors and history, Nathan enjoys taking “a walk back in time” at Eden Gardens State Park in Point Washington, which features picturesque grounds and the elegant Wesley House, built in the 1800s. Although the pace slows in the winter, Destin and other beach communities no longer turn into seasonal ghost towns. Welcoming all extends to special events. Some of Nathan’s favorites include the Sandestin Wine Festival (April) in Destin, Seabreeze Jazz Festival (April) at Pier Park in Panama City Beach, Digital Graffiti at Alys Beach (June), 30A Songwriters Festival (January) at various venues, Destin Seafood Festival (October), Seeing Red Wine Festival (November) in Seaside, and Telluride Mountainfilm on Tour (November) in WaterColor. Additionally, organizations like the REP, a repertory theatre company based in Seaside, and the Mattie Kelly Arts Foundation, a source for music and fine arts festivals and programs, keep the cultural arts alive throughout the year. We’re currently the third fastest-growing area in the country for primary residence and the second most-visited region in the state of Florida. “There are so many activities for all ages—and certainly for young kids,” says Nathan. Although the pace slows in the winter, Destin and other beach communities no longer turn into seasonal ghost towns. “We’re currently the third fastest-growing area in the country for primary residence and the second most-visited region in the state of Florida.” As a matter of fact, tourism expenditures in Destin during the 2014 summer season surpassed all previous records. Not so long ago, when Nathan traveled, he needed a map to point out Destin and 30-A. Today, people are informed, thanks to all kinds of press: Boating magazine named Destin its best place to live and boat; USA Today cited Sandestin Golf and Beach Resort among its ten best beach resort kids’ clubs; and TripAdvisor included Destin among its top ten destinations on the rise in the U.S. Without question, the current generation of Abbotts takes great pride in perpetuating a vision that began with William W. Abbott Sr., who had been stationed at Eglin Air Force Base until retiring in 1968. Becoming a broker in 1970, William began selling condominiums at the El Matador—the only building within two counties that had an elevator—on Okaloosa Island. “Locals would come by just to ride the elevators,” says Steve Abbott, William’s son. Steve moved back home after college, obtained his real estate license and started working with his dad at the El Matador in 1971. “My brother Bill joined us in 1976,” he says. 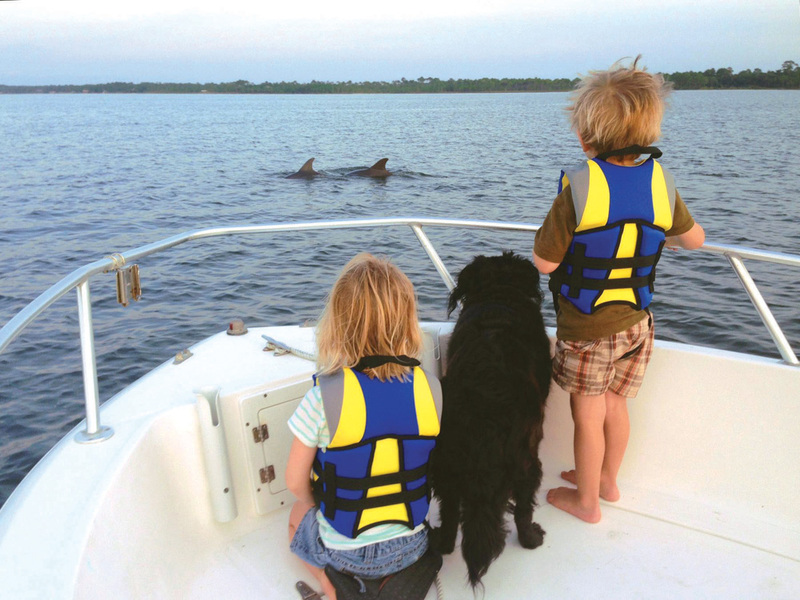 Morgan, Finn, and their furry friend, Biscuit, spy some dolphins in the bay. From living in many countries and traveling extensively as a military family, the Abbotts appreciated the Emerald Coast in comparison to other places. 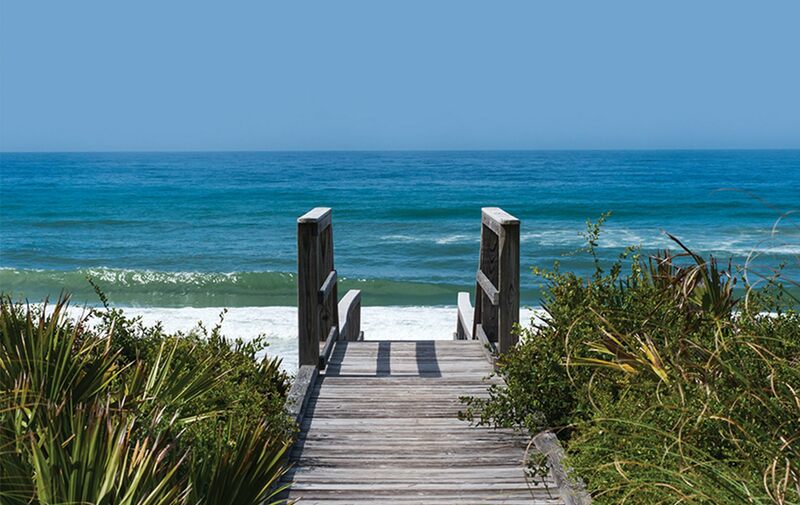 “We thought that Destin and the surrounding beaches were some of the best in the world,” says Steve. “When my brother and I opened an office on Emerald Coast Parkway, which was out in the middle of nowhere but where we envisioned future development, people would say, ‘What are those Abbott boys doing out there?’” Where locals didn’t see much, they saw incredible views. Abbott Realty became the leading real estate company in Northwest Florida through the late 1990s, with over a thousand employees making it the largest employer there since the mid-1980s. Nathan has kept the business in the family by becoming the third generation of Abbott realtors and is a top-producing broker associate for ResortQuest Real Estate. Although times have changed since the inception of the business, its founding principles have remained the same: customer service, knowledge, hard work, and dedication. 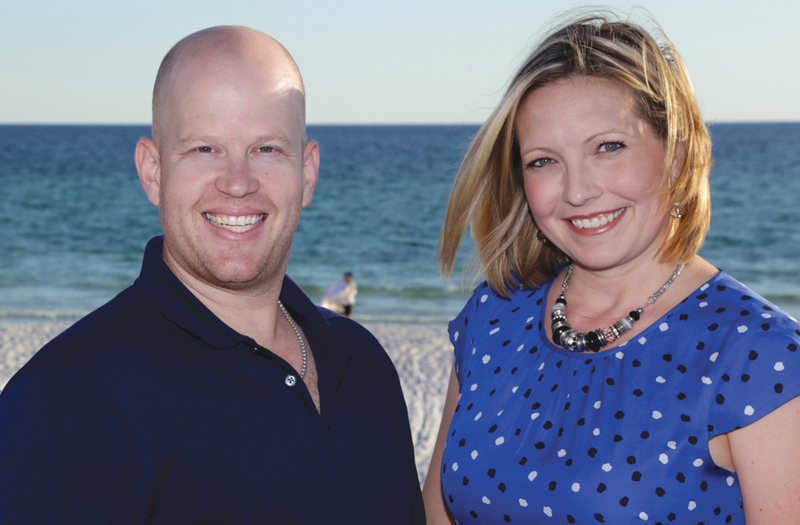 Nathan and Erin Abbott are proud to live, work, and play in Northwest Florida. “I still can’t think of a better place to vacation or to raise a family,” says Steve. Readers can learn more about area real estate opportunities by visiting www.NathanAbbottTeam.com and www.EmeraldCoastLuxury.com or by calling 850-803-7653.